After an enthralling game in Carlanstown on Sunday afternoon Nobber booked their place in the semi-final of this year’s intermediate football championship with a three point win over Ballinlough. Nobber were full value for their victory and held the upper-hand for the majority of this contest yet they were grateful to goalkeeper Davy Hutchinson who pulled off a late save from Simon Deevy when only two points separated the teams; impressive defender Niall Farrell then kicked his third point as they sealed their place in the last four. Nobber can thank the unerring accuracy of Dale Larkin who contributed nine points from a range of distances and angles in a hugely impressive individual performance, Sean Meade, Pauric Weldon and Thomas Murtagh were others to catch the eye in a determined display. The first half was a dour affair with scores hard to come by; Larkin was the sole contributor of all the Nobber scores in the opening 30 minutes. Gary Reilly (2), Peadar Byrne and Tommy Mc Cullen were the Ballinlough scorers as the sides were level; 0-4 to 0-4. However the signs were somewhat ominous for Ballinlough during the first-half, they lost centre back Lorcan Maguire in the opening minute of the game and their usually solid defence struggled in his absence; Sean Meade and Larkin caused plenty of headaches and only for some poor shooting Nobber would have been well ahead at the break. Half-time opinions suggested that ten points would probably be enough to win the contest but Nobber had other ideas; two quick fire points helped them regain their confidence on front of the posts as they added a total of 13 points after the break; combining tough tackling with impressive attacking football. The game opened up considerably in the second half and Ballinlough were well in contention at the three quarter stage when points from Michael Geraghty and Mark Mc Cullen had them level; 0-10 to 0-10, on 45 minutes. But then Nobber made a decisive surge hitting five points on the trot; Larkin (3) and Niall Farrell (2) put them; 0-15 to 0-10, ahead with just five minutes of play left. Ballinlough looked tired but they weren’t finished, the sides traded points then Sean Geraghty and Peadar Byrne combined for Derek Muldoon to palm the ball to the net and leave just two points between the teams; 1-11 to 0-16. Ballinlough went all out attack as Deevy brought a great save from Hutchinson before Niall Farrell steadied their nerves with his third point of the half. Ballinlough will be disappointed with a quarter final exit after topping their group; however it has been an encouraging campaign and with nine of Sundays starting players under the age of 25 they will know bigger days lie ahead over the coming years if they can add tap into some of the underage talent coming through at the club. 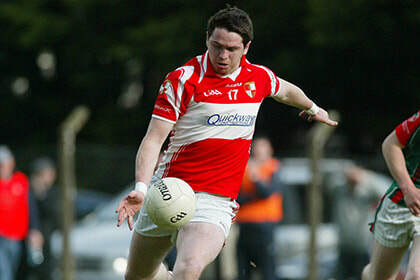 A special mention must also go to goalkeeper Lorcan Gibney who completed the campaign conceding just one goal in six championship matches and also Peadar Byrne; the former county player has been outstanding servant to the club, completing his 19th campaign of first team football and was one of the standout players in the intermediate football championship. Ballinlough: L. Gibney, B. Smith, E. Smith, R. Farrell, J. Baugh, L. Maguire, P. Muldoon, M. Geraghty, T. Mc Cullen, J. Tunney, S. Geraghty, M. Mc Cullen, G. Reilly, P. Byrne and S. Deevy. Subs: J. O’ Reilly for Maguire, D, Muldoon for Tunney and P. Briody for Baugh.